Del Taco is getting on its soapbox to promote a new lineup of Fresh Faves Box Meals. The campaign will include a social media component from San Francisco advertising agency Camp + King that encourages people to promote the restaurants in return for french fry-scented soap. Grilled Chicken Tacos made with fresh-grilled chicken, Half-Pound Bean & Cheese Burritos crafted with slow-cooked beans made from scratch, and the signature Del Taco that’s loaded with hand-grated cheddar cheese are just a few of the items that Del Taco Restaurants, Inc. is offering in its new lineup of Fresh Faves Boxes. Priced at $4, $5, or $6, each box contains handmade fan-favorite items along with fries and a drink and delivers quality and quantity at a price point that only Del Taco can deliver. 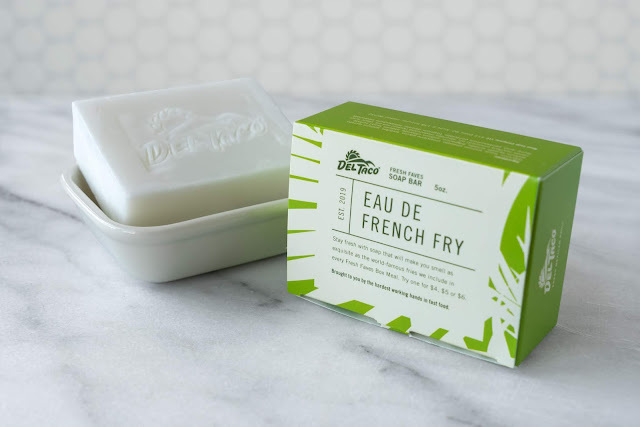 And to make the launch extra fresh, the agency added a social component to drive buzz for the boxes: superfans can get in on the fun and win a free bar of Eau de French Fry soap by posting about their love for Del Taco with the hashtag #FrySoap. $4 Value Taco Box: Two Value Tacos, value fries and a small drink.$5 Variety Box: A Grilled Chicken Street Taco, a Half-Pound Bean & Cheese Burrito, value fries and a small drink.$6 Del’s Favorites Box: The Del Taco, a Grilled Chicken Taco, value fries and a small drink.$6 Triple Chicken Box: Two Grilled Chicken Tacos, a Chicken Quesadilla Snacker, value fries and a small drink.